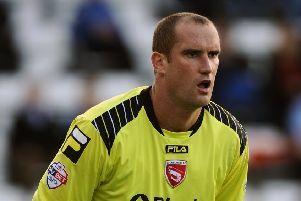 Morecambe boss Jim Bentley rued his side’s luck as they went down 2-1 at York City on Tuesday night. The Shrimps lost both Ryan Edwards and Paul Mullin to injury with Bentley also seeing some refereeing decisions go against his side. The visitors had started strongly with Mullin giving them an early lead before Stephane Zubar’s header and Russell Penn’s stunner handed the Minstermen three points that ensured their League 2 survival for another season. Bentley said: “I’m absolutely gutted and frustrated. “I think we could have had the game wrapped up in the first half an hour. “But then big Ryan Edwards had to come off with a back injury and we had to go to 4-4-2 and Paul Mullin came off at half-time with a hamstring injury. “They got back into it and I’ve got to be careful what I say but I’m still waiting for the decisions to even themselves out this season. “It looked like a foul for the first goal but right throughout the game there were decisions that went against us. “I’m not going to moan about that though. “Once we had to change formation it took time to adjust to it and they got back into it and scored from a corner. “They started the second half the better and made the extra man in midfield count. “Goals change games and at 1-1 the lad’s stepped through and hit it from 30 yards right in the top corner and you won’t see a better goal than that. Bentley felt his side looked ‘jaded’ in the closing stages as they missed an opportunity to give themselves an outside chance of a play-off place ahead of Burton’s visit to the Globe Arena on Saturday. He said: “We looked a little bit jaded and we’ve lost a game we should maybe have won after how we played in the first 30 minutes. “Looking at the results we could have been five points off the play-offs with three to play and that’s frustrating as well.